The Jiffy Steamer J-2000 is a great steamer. A lot like the other steamers i've used it has a base and a hose that is hung from a hook. Its has a great build and I have knocked up against the wall a few rimes and not even a crack. It removes wrinkles very fast , I know its sounds like something it should do. But I have use plenty of streamer that can't even do that, it does it on the first or second go which makes my work a lot more easy to do and a lot less strain on my arm and back, which I love. The heat up time is other thing you wouldn't think of but its does it in under two minutes which is great. I have had streamer that I have to wait around to get working, with the J-2000 it on and hot really fast. It a real time saver with all the time i save not waiting around. The down side would be that it doesn't work very well with heavy cloths, but if you work with it and do a lot of pass overs it can get some heavy stuff done. One of the main things I really dislike is the fact that the hose gets hot when your steaming meaning if it gets close to you, you might get a burn.That would be the down side of the fact that it heats up fast. On the other downside the fact that the wheels on the steamer don't lock and when you swing the steamer around the hose tends to burn you which is why it makes it a really big downside. But if your looking for something that does the job good and fast and don't mind a few burns or you know how to handle a streamer this is the streamer for you. 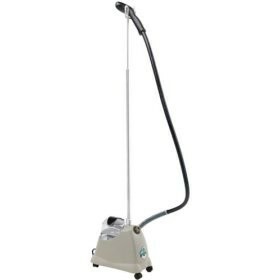 I bought Jiffy J-2000 Garment Steamer about 6 months ago and it has been an excellent product as it warms up in just 2-3 minutes & steams away wrinkles from my shirts,pants,trousers etc.. in a matter of few seconds.This is really a much better product when compared to the conventional Iron box. I have found that Ironing tends to reduce the life & quality of the clothes, when used again & again.Clothes tend to lose color & loses it shine by prolonged ironing. After using the Jiffy J-2000 Garment Steamer I have found that its gentle on cloths as there is no heavy pressing involved & its only the steam that passes through the clothes. About a year and a half ago I decided that I absolutely NEEDED a steamer. After some research I found that even though they may be priced slightly higher than their counterparts- Jiffy steamers are the best. Online reviews told me that Jiffy steamers wont leak, do not have as many wiring issues and are straight forward and easy to use. I absolutely love my steamer. It has saved me a ton of time both in caring for my own clothes and in creating and maintaining garments for photo shoots. I work part time as a photo stylist. This means that I am constantly bringing rack of clothes for models to wear. Having a professional level steamer makes the preparation process for shoots extremely easy. Also this steamer, though heavy, breaks down small enough for me to easily transport it in the back of my car. It should be noted that a steamer will not replace your household iron. I liken it to owning both a hammer and a screwdriver- both are intended to fulfill a different purpose. I steam all of my dresses (of any fabric content) . THe steamer is miraculous of fine silks, rouching, drapes etc. I still iron clothes that need to have the crisp feel to them- tailored shirt, pleats, the crease in slacks. This machine is great to steam those clothes you may have worn briefly but are not ready to go to the professional cleaners. I have saved a lot of money but being able to appropriately care for my clothing. Less trips to the cleaners, less ruined clothes in the wash- it's a win win. Using my steamer could not be any easier. I simply plug it in and in less than a minute it is ready to work. I only used distilled water in my steamer as I was told this would help prevent future problems. The handle does not leak (as many steamers are prone to do). I also love that there is a little hook on the steamer from which to hang my garments. When I am done using the machine I simply unplug it and within a few minutes it is cool enough to store for later use. The size of the machine is reasonable and I store it in a closet. Although I have professional reasons for using the Jiffy steamer- I highly recommend this model for even household use. You will find it very quickly pays for itself with both time and cost savings. I run a wardrobe house for the production and film industry, and as such, I have a large need to steam clothing daily. For the last 10 years, I have been using Wotever Inc as my primary supplier for steamers. I started using the Jiffy steamer 2000 and never looked back. The stats say that the Jiffy 2000 has a 3/4 gallon reservoir, and a 5 1/2 foot hose. I say that is steams for well over an hour without having to refill and it doesn't seem to drip. I have used other steamers, made by other companies, all with flaws that I was not able to overlook. The only problem I have had with the Jiffy is that sometimes the plastic head can get burrs on it which will in turn snag the clothing that is being steamed. I have always been able to remove these burrs with a little bit of sandpaper. The Jiffy company makes a great product to clean their steamers with which is not very costly, and is easy to use, keeping the maintenance of this steamer very low. Transporting this steamer is as easy as putting it in a bin and going. I send these out all the time to on set productions, and I have yet to have one damaged. I will never be tempted by a lower priced steamer again. In this instance, you get what you pay for. Cheaper steamers have given me cheaper products. The Jiffy 2000 gives me dry cleaner results, at a fraction of the cost and time, it's portable, it's easy to use and maintain...what more can you ask for? I purchased the Jiffy Steamer J-2000 Garment Steamer a few months back before Christmas. This was my first garment steamer purchase ever. So far it’s still functioning and it’s a great steamer. It has a removable tank that holds enough water in order to steam for 75 minutes straight without having to refill it again. I really like the fact that it only takes one minute to heat up. I am a person that’s always on the go and can’t be wasting my precious time waiting for appliances to take a long time just to start up and heat up. Another good advantage about having this steamer is that my regular old iron and iron board are out of the picture. I just need the Jiffy steamer and I’m ready to take care of my clothes. My daughter had her prom dress that needed to be cleaned after a full night of dancing, and instead of taking it to the cleaners I decided to purchase the Jiffy steamer and save the cash for something else. I was definitely pleased with the great job it did on my daughter’s prom dress. There was only one thing that was stopping me from purchasing this steamer in the first place, that one thing was the price. At $150 dollars not including tax the Jiffy steamer isn’t a cheap appliance. With taxes added I ended up paying $180 for my steamer. However, I’m glad I didn’t let the price stop me from purchasing such a great appliance. Another thing that I was hesitant about is that I am the first in my family to have ever purchased a steamer. My mother and grandmother like to use a good old fashioned iron. After trying the Jiffy steamer I immediately suggested it to them and they liked it as well. I recommend a Jiffy steamer for anyone looking to save money and do the job on their own instead of taking you clothes to the expensive dry cleaners. It is extremely easy and convenient to use. I purchased the Jiffy Residential Steamer Model J2000 for my husband's dress clothes. I purchased this steamer on line for 189.00. It was money well spent! With it's lightweight, flexible hose, it makes old fashion ironing look bad! I had heard that steam is the gentlest, safest, most efficient method to remove wrinkles from fabrics, all while preserving the fabric of the clothing. I am a firm believer of this after having used this product! I can steam all my husband's dress shirts, his dress slacks, plus it works great on my curtains and drapes! This product works five times faster than conventional ironing. I also heard that this product can eliminate dust mites in bedding in your home... I can't wait to try that one out! The Jiffy Steamer has over 1 1/2 hours of steam per filling. It heats up in approximately 2 minutes! It also has a low profile, easy-to-handle water reservoir and a no spill check valve cap for easy filling, this is great for me, because, unfortunately I have started to get some arthritis in my hands and have some issues with water filling. Other features that came with my steamer were an assembly wrench, a fusible link with automatic shut-off for safety, and color-coded high temperature wiring. There are so many ways to use my new Jiffy Steamer that I am having a great time finding and inventing them. The other day, I bought some new rugs which were wrinkled, of course, I got out my new steamer and solved that problem right away! The wrinkles were instantly released and I couldn't have been more pleased. I definitely recommend this wonderful product to all, including people like me with arthritis. I do lots of sewing and after ruining an outfit or 2 (more like 20) I decided to buy a steamer. I purchased this steamer from an on line web site after doing some homework on it. Like everything there are both pros and cons to this piece of equipment. I find the benefits of the J-2000 Garment Steamer to be that it heats up real quick and is built very well. The water reservoir holds enough water to last over an hour of steaming. The steamer is also easy to move around because of the castors on the bottom of the machine. There is also a magnetic wrench attached to tighten up anything that may come loose, but I am happy to say that I have not had to use it. When steaming my clothes I do not get “shiny” fabrics that I am great at creating with my iron. Additionally in the year or so since I have purchased this steamer, I find that my clothes show less wear and tare that ironing seems to do. As I said earlier I do a lot of sewing and when I use this steamer, the wrinkles just melt out of the fabric. I also love when I change my curtains and drapes with the seasons. I no longer struggle for hours trying to iron these while not getting them dirty because parts of the drapery will inevitable be on the floor while ironing. I just simply hang up the curtain and drapes and steam them in place. This works great! The detractors of the J-2000 Garment Steamer are that it takes a while to get used to steaming techniques versus ironing. I have also burned myself more times than I care to remember with this steamer and now always have a small bowl of iced water on hand to stick a scorched digit into. I have dropped the head of the steamer and have been grateful that I never have children or pets in the area when I am operating this because it is super hot. If you are looking to put a stiff crease into a pair of pants or shirt sleeve I have yet to figure out a way to do it. I find that the iron still works best for this task. Overall I am very, very pleased with this steamer, and I would highly recommend it to anybody!